One of our favorite groups, Radiologists Without Borders (RWB), performs excellent work in underserved communities around the world. We've been a big fan of Dr. Tariq Gill and the efforts of RWB for some time now. Recently, we were able to provide an ultrasound system for an upcoming program that RWB, RADAID international and Together for Ukraine Foundation are planing for September this year. If you haven't heard of Radiologists Without Borders, please take a few minutes to review their activities on the website www.rwborders.org or follow them on Facebook . For years, these physicians and medical volunteers have performed extraordinary work to provide diagnostic imaging equipment, services, training and support to help improve and save the lives of patients around the world. 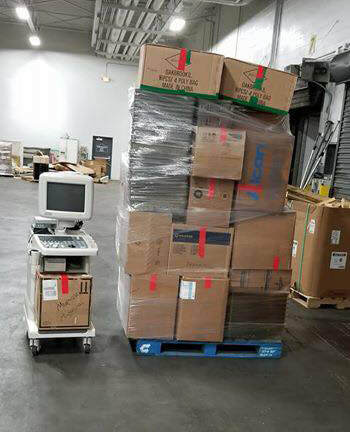 Here is a photo of our donated ultrasound system sitting beside other material waiting to be shipped in support of RWB efforts. Keep up the good work RWB Team! 'Trying to find a white rabbit in a field of snow.' That's how Dr. Philip Fear, radiologist at Saratoga Hospital described identifying dense breast tumors in a recent ImagingBiz article discussing the hospital's use of SOFIA 3D breast ultrasound. Dr. Fear discusses SOFIA's impact on patients, sonographers and physicians in the article, which you can read by following this link. SOFIA can be a great tool when imaging dense breasts. Give us a call or send us a note, we'll be happy to have a conversation about the potential impact SOFIA and other breast imaging tools can have in your practice. Read the ImagingBiz article featuring Saratoga Hospital's use of SOFIA 3D breast ultrasound. Heading to AIUM in Orlando! 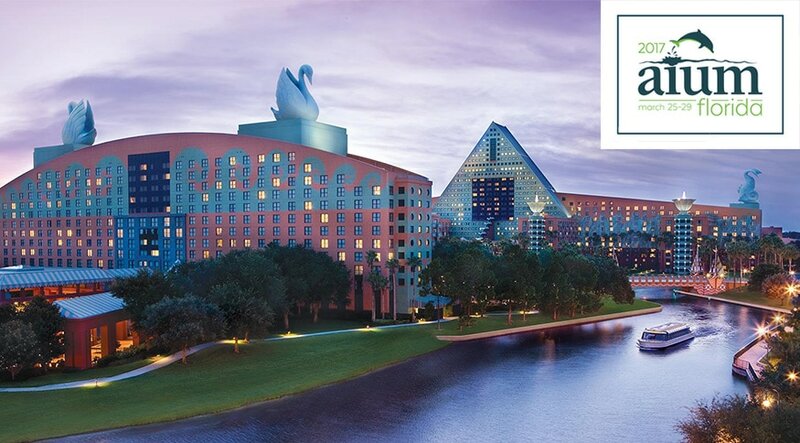 Leaving the cold and snow to head down to Orlando for the 2017 AIUM meeting at the Walt Disney Swan and Dolphin hotel. Looking forward to being warm, seeing old friends, and making new ones. Look us up at the Esaote exhibit, booth #613. As always, there should be a lot of very interesting presentations, posters and learning experiences for everyone. Can You Easily Report Dense Breast Volume? Capital Imaging, in Latham, NY effectively used their Volpara data to address a critical question from a referring physician. Capital Imaging has VolparaAnalytics, which automatically collates data from digital mammography and tomosynthesis units to enable cross-comparison of patient populations, x-ray units, and operator performance. “The referring office was concerned about their volume of dense breasts diagnosis.” said Masone. “So I was able to look at our data and let them know that only 30% of the patients they were sending to our facility were dense, significantly lower than their initial, anecdotal impression. Needless to say, that made them feel a lot better and cemented our relationship with them. 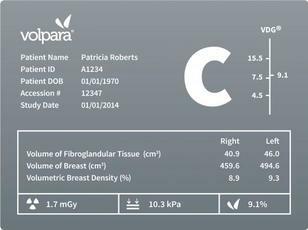 Utilizing the unique, quantitative information provided by Volpara, breast centers can improve quality assurance, do better resource planning, and better understand the population they serve. For more information about Volpara, follow this link or contact us directly. Capital Imaging utilizes VolparaDensity to help them rapidly categorize breast density for all mammography patients. Each mammography exam is routed through Volpara and the resulting findings are presented to radiologists in the reading room along with the mammography images. “VolparaDensity is helpful for all our mammography patients, but our radiologists find it to be most valuable for borderline patients,” observed Masone. Although Capital Imaging’s radiologists make the final decision, the quantitative data provided by VolparaDensity helps them minimize subjectivity when they categorize breast density. As New York’s breast density law took effect in 2013, Ultra Imaging Solutions introduced Volpara Density to Capital Imaging and they quickly integrated it into their breast imaging routine. “Patrick Schmidt was here to oversee the installation and worked with our IT staff to make sure everything went smoothly,” said Masone. Integrating VolparaDensity into their breast imaging workflow has been a great help to Capital Imaging and their patients. “We rely on patients being part of an active team with their physicians”, said Masone. “If they’ve been categorized with dense breasts, we help educate them to ease their anxiety. But the first step is to correctly identify the level of density in their breasts and eliminate unnecessary stress, which can have other implications in a patient’s life”. Follow this link for more information about VolparaDensity, or contact us directly. For more information about Capital Imaging, visit their website via this link. The Radiological Society of North America is celebrating it's 100th year this year during its annual meeting in Chicago and the atmosphere is predictably energetic and dynamic. Here's a photo of the Esaote exhibit on Sunday morning before the show opened. You can see exhibit staff getting ready for the crowds to come. Sorry we don't have a shot of a busy show floor, but once the show opens things get busy because there is a lot going on, including excellent clinical papers and hot topics. Of course, the exhibit hall always gets a lot of attention, and we're busy showing products, seeing old friends and making new ones. There's always something new at RSNA! 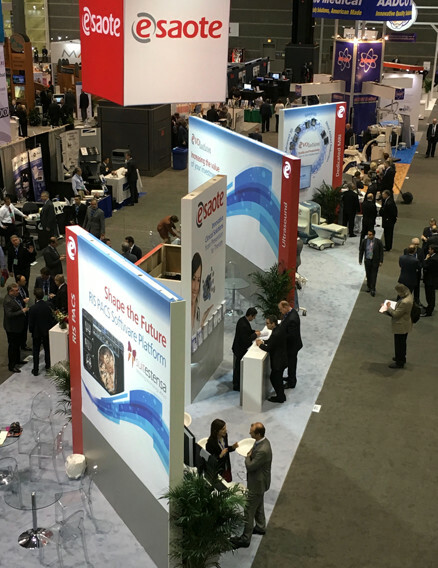 If you happen to be in Chicago for the RSNA this year, please stop by to see Patrick Schmidt at the Esaote booth in the South Hall #3711. Twenty four states now have dense breast notification laws on the books, but the healthcare community is still debating the best course of action once someone has been notified they have dense breasts. Now there is a great educational tool available at densebreast-info.org to help patients and providers learn more about dense breast issues. With content curated by a diverse and respected panel of medical experts, the site has answers to a wide range of common post-notification questions, detailed information on detection technology and updates on legislation. It's an excellent site, filled with critical information, including insurance coverage on a state-by-state basis. What better time to educate ourselves about dense breasts than October - Breast Cancer Awareness Month? At Ultra Imaging Solutions, we focus on women's health issues, including breast density software and automated breast ultrasound. We're big believers in education and clear communication, which densebreast-info.org does very well. We encourage you to explore the site for yourself by visiting densebreast-info.org today. 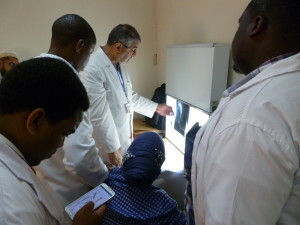 In an earlier blog post, we highlighted the excellent work of Radiologists Without Borders. In addition to education and training, the mission of RWB is to bring life saving diagnostic imaging solutions to medically underserved populations worldwide. To help achieve the RWB mission, Ultra Imaging Solutions recently donated an Esaote ultrasound system for use wherever it is needed. "We're strong supporters of Radiologists Without Borders," said Patrick Schmidt, president of Ultra Imaging Solutions. "Their vision of compassionate care aligns with ours. We're happy to provide this ultrasound system to help improve care for the community where it will ultimately reside." RWB depends upon financial and equipment donations to help them achieve their goals. When organizations like Ultra Imaging Solutions donate equipment, RWB raises funds and works with NGOs and other organizations for shipment and all necessary local permits and clearances. Dr. Tariq Gill, founder of Radiologists Without Borders said, "We deeply appreciate the support of Ultra Imaging Solutions and the donation of this system. It will be put to good use in our efforts help improve the quality and accessibility of healthcare around the world." 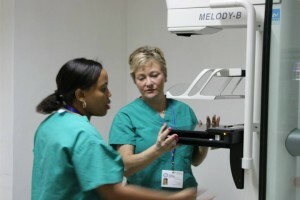 Please visit Radiologists Without Borders at www.rwborders.org to learn more about their efforts. While you're there, please consider volunteering, donating, or purchasing an item from their online store. 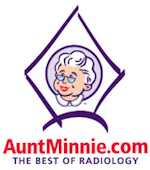 The votes are in and the 2015 Minnie Awards finalists have been named. We're proud to highlight two products that were honored to be semi-finalists in the Best New Radiology Device Category, Esaote's MyLab® Gamma ultrasound system and the Sofia automated whole-breast imaging system from iVu Imaging. MyLab Gamma is an affordable, laptop-based system that combines comprehensive shared service applications with compact ergonomics. Customers who are using MyLab Gamma are pleased with the price-performance ratio of this portable system. Follow this link to explore MyLab Gamma in more detail. Sofia is an automated whole-breast ultrasound imaging system that makes it fast and easy to acquire bilateral breast ultrasound as a perfect follow up for women with dense breasts. Recent upgrades to the product have made it even faster and easier to use. Follow this link to explore Sofia in more detail. If you’d like to discuss how either of these new products could impact your clinical capabilities and workflow, feel free to contact us. When you talk with Dr. Tariq Gill about Radiologists Without Borders, the organization he founded in 2008, you can easily understand why he and his organization have so many fans and supporters. Dr. Gill and the other volunteers at Radiologists Without Borders are impassioned and committed to making a difference in people's lives, no matter their socio-economic status. We've been fans and supporters of Dr. Gill and RWB since it's inception. RWB not only supports the local teams while they're on a mission trip, they also educate with the goal of sustained, long-term improvement in the quality of care within the communities they visit. Current projects and missions are underway in several areas, most notably Tanzania, Honduras, and Ukraine. Each of the projects has their own focus, based upon the needs of the community, but they share the common bond of compassionate care and respectful integration within the respective hospital communities. The goal of RWB to is to be true partners, not interlopers. RWB's most recent trip was to Muhumbili University of Health and Allied Sciences (MUHAS) in Dar Es Salaam, Tanzania. 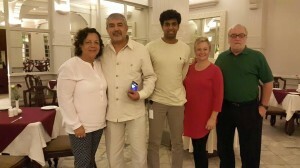 For a fascinating diary of the trip, check out this link to the blog posts by Dinesh Kommareddy at the RWB website. As many of us look back on memories of our summer vacations, Dr. Gill and RWB volunteers will reflect on the impact they had on the lives of patients and healthcare practitioners in Tanzania. On the final day at MUHAS, Dr. Gill had each resident he had worked with recite the modern Hippocratic Oath "...I will remember that there is art to medicine as well as science, and that warmth, sympathy, and understanding may outweigh the surgeon's knife or the chemist's drug..."
We've supported RWBs work for some time and encourage you to do so as well. Please visit their website at rwborders.org or their facebook page to learn more about RWB activities and provide financial or volunteer support for their valuable efforts.